Rare Disease Day is approaching, and to support the Children’s Hospital of Philadelphia (CHOP) and St. Jude Children’s Research Hospital, the New Hope Run Club is holding a Zebra 5K Run/Walk on Tuesday, Feb. 26. The cost for this philanthropic race is $20 (registration is here) to run or walk, and can be done “virtually,” meaning a person can go the distance any time if the date doesn’t match an individual’s schedule. A pledge account can also be created, so more than the initial registration fee can be raised if desired. If a participant registers before Feb. 15, they will receive a t-shirt. The virtual race works like this: A participant can do a 5K on their own or follow the designated route that will be outlined by the run club and report their time via “honor code.” If one choses to use the Strava or Map My Run apps, a runner could compare their times with others. For people who join the run club for this event, segments of the race are going to be selected so that runners can receive door prizes, which include a “runner box,” gifts from Celt-Iberia Traders in New Hope, packages from Arbonne and Nuun, services from Functional Life in New Hope, and more. All the money raised will go to Avery’s Hope, which has partnerships with CHOP and St. Jude. Avery’s Hope was started by Village 2 resident Caryl Harris whose grandson, Avery Harris, was born with Microvillus Inclusion Disease. Board President of Village 2 and New Hope Run Club Co-founder Tom Corrigan, is the charity’s treasurer, and his nephew, Carson Corrigan, age 3, suffers from rhabdomyosarcoma. Around 7,000 diseases are considered rare; approximately one in 10 Americans have a rare disease, and the zebra is the official symbol of rare diseases in the U.S. The charity’s impact statement further elaborates on how they have covered patient expenses when insurance lapses or unemployment occurs. 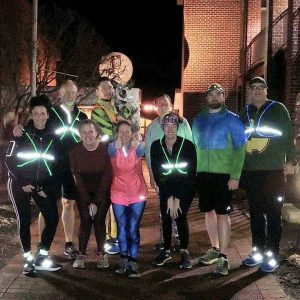 The New Hope Run Club is a casual community of runners who meet every Tuesday night, regardless of the weather, and follow alternating routes. The group was founded by Kelleen Gebler and Corrigan two years ago. The club’s schedule can be found here, including their regular Tuesday night runs and one-mile morning offerings. For this particular race, there are registered runners in 12 states and one in Colmar, France (see map below). If choosing to join the run club for the 5K in person, Triumph Brewing Company in New Hope will be the starting point at 7 p.m. on Tuesday, Feb. 26. Carson will attempt to do the race countdown live via FaceTime from St. Jude.